One year on from its opening, 3 Fils has become a word of mouth hit. But can the community-minded little restaurant that could keep up? Before we go on, allow us to declare an interest. We’ve had a soft spot for chef Akmal Anuar ever since he graced our cover in February 2017. Back then, he was clearly nervous about what was to come for his little 30-seater eatery in Jumeirah Fishing Harbour, a labour of love that he, along with two business partners, had ploughed his every last dirham into in an effort to create something truly new for Dubai’s dining scene. If his pedigree – ten years at the helm of Singapore’s most lauded restaurant, Iggy’s, before being brought to Dubai by none other than Richard Sandoval to oversee the opening of Zengo – was impressive, his new product was far more modest. 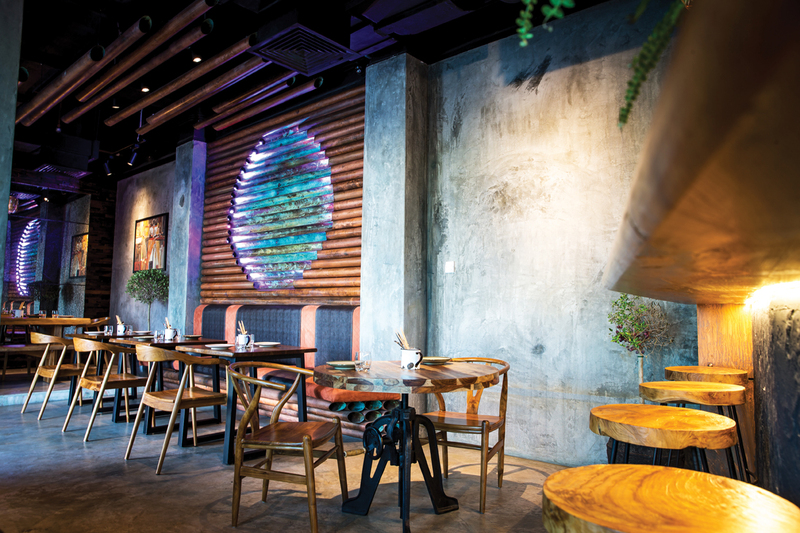 And while his ambition to make good food fun and accessible was clear to see, the question remained – would Dubai’s diners, used to expensive, see-and-be-seen hotel restaurants, connect with an unlicensed café space serving top-level food at low level prices? One year on, the answer, it seems, is a resounding yes. These days, turn up at 3 Fils of an evening and you’ll likely have to queue for a pew. Akmal has gone from ordering 7kg of tuna a week to 30kg, and he’s still running out. Truffles have entered the fray, now that he can afford to stock them. And for the first time since it opened, there’s a new menu too. It could have been a risk – much of 3 Fils’ success in the past year has come from regular guests, now referred to warmly as family, returning time and again and bringing new friends. Those family members have favourite dishes, and changing them could have easily caused consternation. Thankfully, many of the most popular dishes either remain, or have been tweaked enough to add interest without scaring anyone. The beef carpaccio starter, for example, topped with rocoto sour sauce and veal chorizo oil, is still there, though potentially even more tender and flavourful than before thanks to the increased ordering of top quality wagyu. It’s joined on the starter list by a zingy new king crab salad, spiked through with the heat of chilli and the freshness of mint. Corn waffles remain, only now topped with pulled beef, Asian BBQ, chipotle sauce and avocado – delicious, but don’t wear white. One of our favourites, dragon sushi, also survives the cut, but is joined by the new asparagus tempura sushi, topped with a chilli pepper soft fried egg that cuts perfectly through the iron of the still crisp vegetable spears. From the grill, a guajillo chilli sauce and Spanish onions give fresh interest to the ubiquitous black cod, while ‘Indomie’, jokingly named after the popular Singaporean instant noodle pot but in fact a toothsome and spicy bowl of slippery noodles spiked with mange tout, baby asparagus, veal chorizo and chilli, remains one of the kitchen’s most requested dishes. Individually, each of the sharing plates are small, but beware the temptation to keep on ordering until there’s no room for dessert – there’s a real opportunity to have fun at the end of the menu. We won’t ruin the surprises that come with the karak ice cream or the intriguingly named ‘the tomato that wants to be a strawberry’, other than to say that they’ll make you both giggle and gasp. Nonetheless, for us, eight visits in, the order is now always the same – a ‘toothfairy’ saffron meringue with sour violet curd and blackberry, an ‘African Powerhouse’ of Ghanaian dark chocolate with Madagascan vanilla ice cream, and a row over who gets the last mouthful. We’ve become ever-so-predictable, mildly embarrassing family members. And the truth is, we’re much happier for it. How much of your produce do you source locally? We source most of our vegetables locally and some of our fish, including seabass and yellow tail, from the Fish Farm in Jebel Ali. Sometimes if I’m lucky, I also bring in fresh fish from my weekly fishing trips. Supporting other local homegrown businesses like ourselves is definitely at the core of our ethos. We have been so lucky and blessed to have the support of other local businesses when starting out and I know how hard it is, especially in a highly competitive market like Dubai. Above that, I know what a difference it can make to them, their team and their lives. And you’re now working with the local fishermen too? One of my favourite pastimes is fishing and naturally, being located in Jumeirah Fishing Harbour, I’ve built a relationship with the fishermen here. One of the owners came to dine in 3 Fils and introduced me to others, so when the opportunity to buy some of our fish locally presented itself, I jumped at it. You’ve run a number of charitable initiatives from the restaurant, including feeding local labourers. Why is that important to you? Giving back to the community is a core value of 3 Fils. I see it in my partners and my team every day and I am so proud of them and their sense of empathy. I want 3 Fils to be more than just a restaurant, to be a family, and giving back is very important as I know exactly how it feels to have nothing. We faced many challenges taking off and I was at a point where I was down to my last dollar. I had nothing. Along the way, we had the help of so many people and by a stroke of luck, we had the right people come in and that changed our lives. This is why I feel so strongly about it, especially as there are ways to help that are so easy and can make a real difference in someone’s life. Our restaurant now is a product of so many peoples’ efforts, and the fact our tiny family now transcends its physical boundaries is a big reason for our success.